Our team investigates several complementary principles to enable force sensing focussing on direct, integrated and high performances. This section deals with the prototyping of a new piezoresistive microforce sensor. An original design taking advantage of both the mechanical and bulk piezoresistive properties of silicon is presented, which enables the easy fabrication of a very small, large-range, high-sensitivity with high integration potential sensor. The sensor is made of two silicon strain gauges for which widespread and known microfabrication processes are used. The strain gauges present a high gauge factor which allows a good sensitivity of this force sensor. The dimensions of this sensor are 700 μm in length, 100 μm in width and 12 μm in thickness. These dimensions make its use convenient with many microscale applications, notably its integration in a microgripper. The fabricated sensor is calibrated using an industrial force sensor. The design, microfabrication process and performances of the fabricated piezoresistive force sensor are innovative thanks to its resolution of 100 nN and its measurement range of 2 mN. This force sensor also presents a high signal-to-noise ratio, typically 50 dB when a 2 mN force is applied at the tip of the force sensor. This force sensor has been integrated with a piezoelectric actuator. Each finger of the microgripper has its own force sensor enabling the measurement of contact force with high accuracy and dynamics. It thus enables to have a highly sensitivie microgripper able to sense forces at the microscale. Below are the picture of the microgripper and its related performances. These works, deal with a 3D-printed vision-based micro-force sensor intended to be used inside the chamber of a Scanning Electron Microscope (SEM). The combination of 3D printed elastic structures with a highly effective vision based measurement method allows to design integrated sensors at the cutting edge of the state of the art. Moreover the presented design respects the Abbe’s alignment principle. The paper presents the general design, manufacturing and experimental characterization in SEM environment of the proposed sensor. Images of periodical patterns are used to measure the differential displacement between the two parts of the compliant structure. By the knowledge of its stiffness, the force applied on it is measured. The stiffness of the elastic structure has been measured to be 15.3 N/m, leading to a force range of 25 N. V. Guelpa, J. S. Prax, Y. Vitry, O. Lehmann, S. Dehaeck, P. Sandoz, C. Clévy, N. Le Fort-Piat, P. Lambert and G.J. 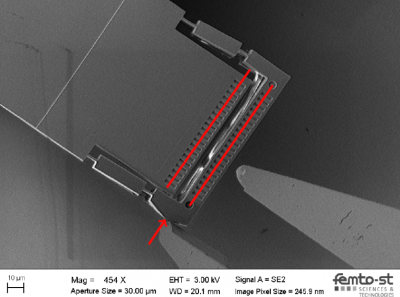 Laurent, 3D-printed vision-based micro-force sensor dedicated to in situ SEM measurements. IEEE/ASME - AIM International Conference on Intelligent Mechatronics, Munich, Germany, July 2017. B. Komati, C. Clévy and P. Lutz, High Bandwidth Microgripper with Integrated Force Sensors and Position Estimation for the Grasp of Multi-stiffness Microcomponents, IEEE/ASME Transaction on Mechatronics (T-Mech), 21(4), pp. 2039-49, August 2016. V. Guelpa, G. J. Laurent, P. Sandoz and C. Clévy, Vision-based microforce measurement with a large range-to-resolution ratio using a twin-scale pattern, IEEE/ASME Transaction on Mechatronics (T-Mech), 20(6), pp.3148-3156, December 2015. B. Komati, J. Agnus, C. Clévy and P. Lutz, Prototyping of a high performant and integrated piezoresistive force sensor for microscale applications, Journal of Micromechanics and Microengineering (JMM), 24, 035018, February 2014.